Small dog house measures 23" wide by 31" deep and stands 31" tall. Finished with your choice of siding color, trim color, and roof shingle color. 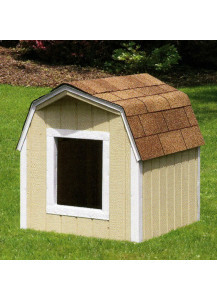 Medium dog house measures 30" wide by 34" deep, stands 36" tall. Finished with your choice of siding color, trim color, and roof shingle color. Duratemp Clay Walls, White Trim, Lt. Brown 30-Yr Shingles, Measures 46"Lx35"Wx43"H. Delivery Available. 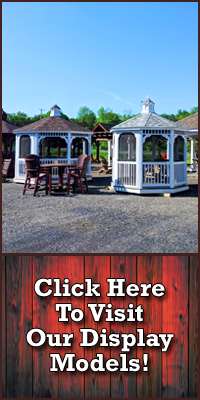 Handcrafted in the United States by Expert Amish Woodworkers. Fully assembled and ready for delivery from our Red Hook, NY location. Stock Number DHL0103. Large dog house measures 35" wide by 41" deep, stands 43" tall. Finished with your choice of siding color, trim color, and roof shingle color. Duratemp Clay Walls, White Trim, Lt. Brown 30-Yr Shingle. Measures 46"Lx35"Wx43"H. Delivery Available. Handcrafted in the United States by Expert Amish Woodworkers. Fully assembled and ready for delivery from our Red Hook, NY location. Stock Number DHL0101. Extra-large dog house measures 41" wide by 46" deep, stands 48" tall. Finished with your choice of siding color, trim color, and roof shingle color.